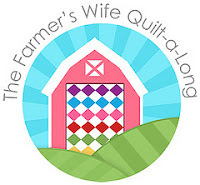 By now many of you have probably heard about the Flickr Farmer's Wife Quilt-along. If not, consider yourself warned! I tried to resist but once I saw Camille's blocks I was sold. I ordered my book a few weeks ago and I want to share my review with you now that I'm ready to finally start working on my quilt blocks. The first half of the book features letters written by 1920's farm wives sharing why they think farm life is better than city life. 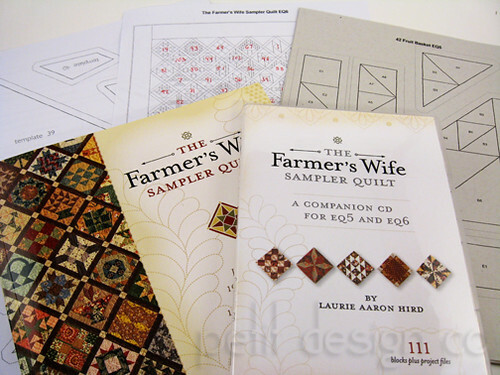 Each page also features a photograph of a single block found in the sampler quilt. To tell you the truth I read a handful of letters and then got bored. It's just not my cup of tea! The second half of the book features a single block per page along with template cutting instructions and a block assembly diagram. There are no written instructions on how to piece the blocks or in what order to piece the segments. Most blocks are pretty straightforward as to how you would piece the segments, but some of the more intricate blocks could be tricky. The last 10 pages of the book has minimal instruction on how to assemble the quilt and add borders. The very back of the book holds a CD with PDF files of all the templates required to make the blocks. The frustrating thing is that each template (100+) is on an individual PDF file. So printing out each template as is would require 100+ pieces of paper! I spent the better part of a day merging those templates into 14 pages. Unfortunately because of copyright rules I cannot share those files with you. There were also no instructions on how to use templates to piece together a block, so if you've never used templates this may not be the quilt for you. You get a project file, as well as the whole block library and the fabric library. I have EQ6 and I was able to print out paper piecing templates for assembling my blocks. You can also get rotary cutting instructions for each block. You can easily design your own quilt by dragging and dropping blocks, and trying out different colorways or fabric lines. So those are my opinions on both the book and CD. The biggest problem I have heard on the Flickr group is that those using the templates are having a hard time getting consistent finished block sizes and points that will be chopped off once sashings are added. While I can get rotary cutting instructions from the companion cd some of the sizes are in 16th of an inch increments. For example you will be directed to cut 4 squares measuring 2 and 5/16" Most quilting rulers are marked for an eighth of an inch. Besides I know that I would definitely mess up cutting when 16ths are involved. I really want to learn how to paper piece. I've only made 1 paper pieced block ever. Oh and in case you are wondering I printed my paper piecing templates on some newsprint that I cut down to 8.5"x11" and ran through my printer. Newsprint is thinner than regular copy/printer paper so it should tear away easier than copy paper. I did have to run each sheet individually through the printer because the rollers kept grabbing more than one sheet at a time. Out of 14 papers only one got jammed and that was because the feeding end wasn't completely flat. Great post. Thanks for all the info.